And Holy Crap I bought a copy. Memory serves me, I HATE THIS SHOW! It was awful, horrible, and awful. To be fair though, I hated it because it bumped Thundercats, (or was it GI Joe?) off the air of prime time kids TV around 3:30 in the afternoon. 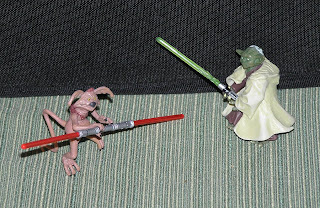 Those were glorious days, in which I'm still trying to recreate unsuccessfully (and now that I'm 30, its officially creepy) Thank God for the squeaky clean internet though, I can still buy toys online without me looking weird in the Toy aisle with all those kids. 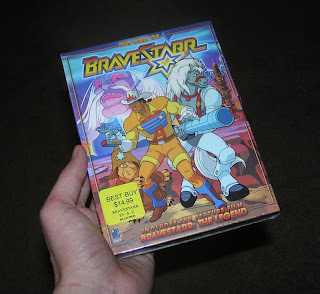 ANYHOW, BraveStarr, the best of that is, is now on DVD! Disc 1; the feature film. Disc 2; the top five episodes voted on by fans. Yes, fans??? WHO THE HELL OUT THERE IS STILL A BRAVESTARR FAN TO VOTE ON THE BEST EPISODES??? ok, maybe it was me. So I like to re-experience the strength of a bear, the Speed of a puma, the antics of Thirty-Thirty an upright talking horse with a gun called Matilda, and the power of... Bravestarr! 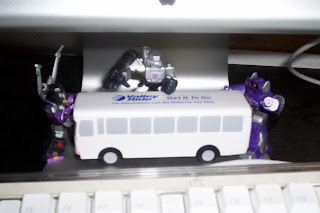 Decepticons interested in a bus? The jokes on them, it's just a foam hand squeezey, not an Autobot. The Prototype H-24 car has been keeping me company today at work. 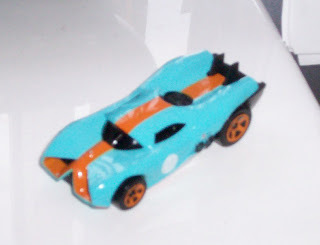 I really like the design of this car. It also has the ability to blur a cheap digital camera's focus. 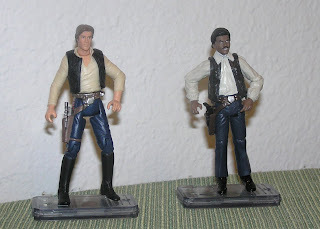 Why did Lando take Han's clothes? 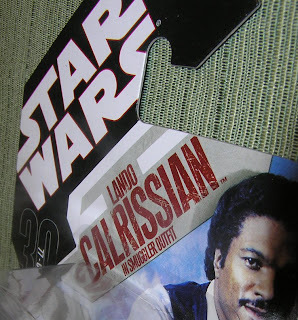 'Lando Calrissian in Smuggler Outfit!' This means that the uniform is a smuggling outfit! Which is very strange, because one would think this profession to be very secretive. I would hate to be caught smuggling spice at Walmart just because I was wearing the flagged smuggler's outfit. Oh well, I'm afraid I still can't answer this most strange situation. Can you? I got to go on my first official business trip this week to Las Vegas. And like all businessmen in Las Vegas I went to FAO Schwarz toy store in Caesars Palace. 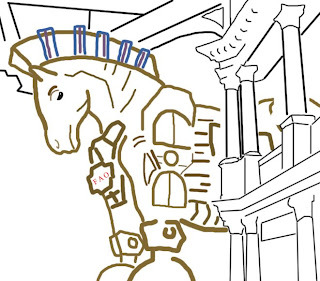 I forgot to take a picture, but this is how I remembered the entrance (with the help of someone who did take a picture, and then me tracing over it). 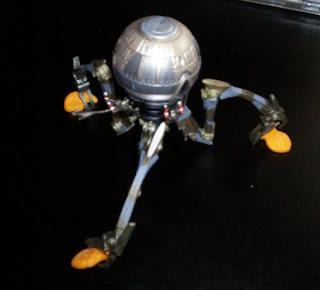 Lots of strange and unique toys there, but nothing of my normal fancy. If I had baggage space, I might have sprung for the Star Wars Empire Round table from the first Death Star and the funny haircut who gets chocked guy. They also had that Lego Death Star, that I plan to get someday, build, and throw down the parents stairs. But that was it for Star Wars, kind of bummed about that. The store had a plentiful supply of Monopoly games and various versions, after looking at them, I tripped over the floor piano, but rebounded nicely. A few people gasped near by, thinking I was going to fall onto the floor piano. That would have been great, to trip and fall, then to make music while your down. It would be even greater to play that 'wah wah wah- wahahahah...' theme that plays after most cartoons or muppets take a dive. Suprisingly after all those years of wanting to see that store, I didn't buy anything for myself. I did find a Playmoble Biker guy, for a friend at work. So I didn't go empty handed. It was more of the experience that I will treasure forever. 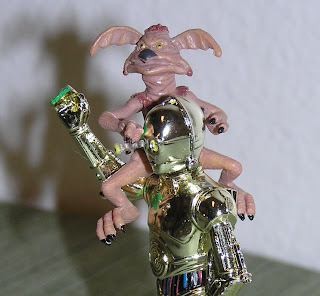 Not many people know that Jabba's tail custodian was a dangerous Sith Lord. If only he hadn't been so consumed of hate for C-3P0's eye, he might have fought Luke, winning Return of the Jedi. 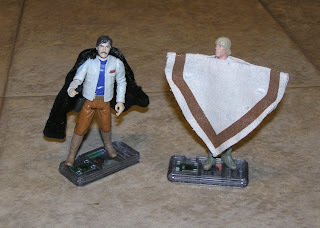 Luke was always Jealous of Biggs's cape.